Does your website invite registration? All e-mail marketers want more e-mail subscribers. Subscribers spend money. If visitors come to your website for one reason or another, they should be encouraged to register to receive your e-mails. If thousands come to your website and fail to register, you do not have a very good website. The value of an e-mail subscriber varies widely from one company to another. The same subscriber can be worth $4.00 to a retail store and $240 to a rental car company. Both can be measured using lifetime value. Both companies want more e-mail subscribers. How do you get them? There are many ways, but most of them involve registering visitors who come to your website so they can receive your e-mails. Here we have a significant problem. 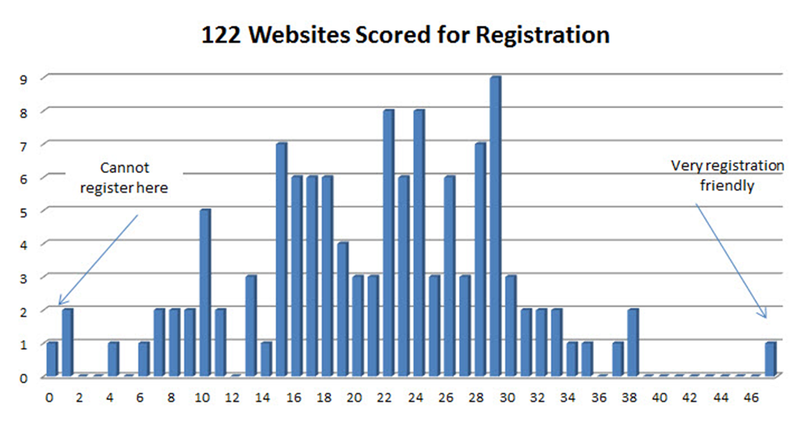 The e-mail marketing staffs at the 122 companies were all given these scores. They understood the scoring system. Those with low scores understood that changes should be made if they were to get more subscribers and what these changes should be. But, in many cases they could not get the changes made. Why not? The answer is an interesting one. For historical reasons, in many companies, the staff that is responsible for the website is different from the staff that sends out the e-mails. Each has their own budget and goals. The e-mail marketing staff is interested in boosting revenue from sending out e-mails. The website management group is also interested in increasing revenue from their website, but may also have other objectives. Websites often fall under the purview of the advertising department, since, when websites were first created, they were conceived as a way to wave the flag, and represent the brand. Often websites fall under a committee representing different parts of the company. The advertising folks want to present an image of their brand. They use focus groups to get public reaction to the appearance of their site. Putting a box saying “Register here to get 10% off on your next order” does not fit into their high level picture of what their brand stands for. They may fight efforts to change the website to encourage registration. Even when the website folks are willing to make the needed modifications, there is often a budget problem. Who provides the money for changing the website to make it more registration friendly? The e-mail marketing staff has an annual budget which is based on the number of e-mails that they plan to send out. Say that there are 2,000,000 subscribers who will get two e-mails per week. At an overall cost of $4.50 per thousand, that is an annual budget of $936,000. There is no extra slush fund. If it costs, for example, $30,000 to make changes in the website, who has the budget for that? Even worse, if the money is found and it results in adding 1,000,000 to the number of subscribers (as is quite possible) where is the e-mail marketing staff going to get the extra $468,000 to send e-mails to these new people? They will have to go back to the CFO who may have already allocated all the money he has available for e-mail marketing this year. E-mail marketing is often an overlooked stepchild in the marketing operation. E-mails produce sales not only in the e-mail shopping carts, but they also get subscribers to visit stores, order from the catalog, or go to the website. In most companies, the CMO is interested in boosting sales through all media. Recognizing that websites and e-mail marketing should work together it is up to the CMO to coordinate the budgets so that can happen.